Giant leek tradition 'under threat' Jump to media player There are fears the great North East tradition of prize leek growing will soon become a thing of the past. Secrets of a giant vegetable grower Jump to media player A Nottinghamshire giant vegetable grower talks about his knack for breaking world records. There are fears the great North East tradition of prize leek growing will soon become a thing of the past. 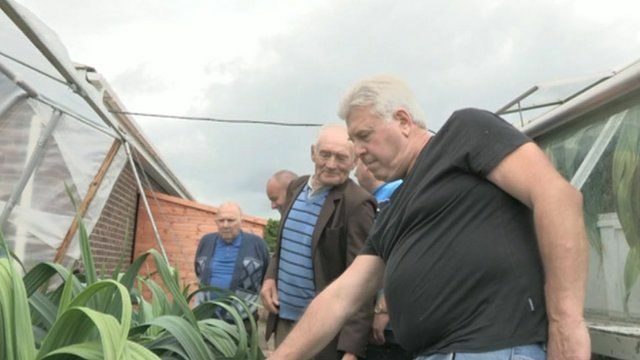 The growing of prize leeks, and other giant vegetables, has its roots in the region's mining heritage, when it offered pitmen a welcome hobby out in the fresh air. But with only a handful of leek shows remaining, there are concerns that this proud northern tradition could soon be lost forever. A handful of leek men in Ashington, Northumberland, stoically keep the tradition alive. The full report can be seen on Inside Out, North East & Cumbria on BBC One at 19:30 on Monday 19 October.